Pegasus Ventures Michigan prints restaurant guest checks specifically to meet the needs of your restaurant. Looking for something more than can be found on our stock imprinted guest checks page? This is the place to learn about customized restaurant guest checks printed just for your food service business. Pegasus Ventures Michigan ensures customers get as much as needed to develop a custom guest checks or waiter pad meeting the need and keeping costs down. Pegasus Ventures Michigan offers dozens of options for paper choices. Most restaurants choose the papers most used in standard guest checks. Bond paper most commonly used as a top copy of a carbon-less guest check. Think of the paper commonly used in a home printer just a bit lighter. The other paper most used paper in custom imprinted restaurant guest checks is "tag" or "ledger" paper. Most often used as the sole paper in 1 part padded guest checks or as the last bottom part in 2 and 3 part guest checks where the bottom copy needs a stiffer paper. The "tag" or "ledger" paper is stiff like an index card but a bit lighter in weight and has a smoother feel than an index card. Looking for something else? Share your specifications with Pegasus Ventures Michigan, we'll meet the requirements of your restaurant! Custom Printed Guest Checks- how many parts? Most restaurants ask for 1, 2 or 3 part restaurant guest checks when constructing a guest check for their restaurant. Pegasus Ventures Michigan only prints customized restaurant guest checks using carbon-less paper. Not much call for the carbon paper these days making it more expensive to run with the custom restaurant guest checks! Pegasus Ventures Michigan names part one the top part and names the parts sequentially down from the top copy. Typically in multiple part restaurant guest checks the top copy is white, the next copy is yellow and the final copy in a 3 part booked restaurant guest check is pink. The loose restaurant guest check typically has stiff paper for part 3 and usually customers choose white for this color being the most economical. Customized Printed Guest Checks- Loose, booked or padded? Loose means the restaurant guest checks are not in pads or books. (Hard right?) Most often customers order loose guest checks in carbon-less 2 and 3 parts. Occasionally, Pegasus Ventures Michigan finds a restaurant needing 4 part guest checks, but it's atypical. 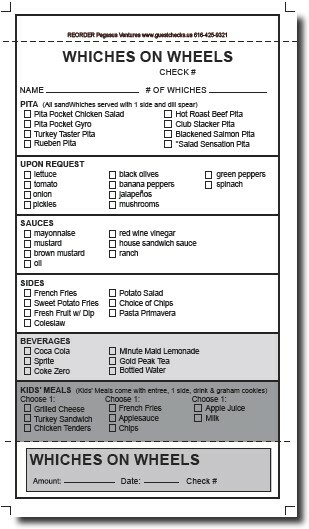 Most often customers ordering loose custom imprinted restaurant guest checks like to see a stiffer paper for the bottom copy with the other copies more light weight bond paper. Pegasus Ventures doesn't get much call for loose 1 part guest checks, but when a restaurant is looking for a one part loose guest check most often this is a stiff ledger paper. Padded guest checks generally means 1 part guest checks either using standard bond paper or the heavier weight tag, also known as ledger, paper. Pegasus Ventures Michigan typically books restaurant guest checks when multiple part guest checks are called for in the custom printing. There is a manila wrap around attached to each book to place between each set of restaurant guest checks preventing writing through to the next set of restaurant guest checks. Pay nothing for your free, no obligation estimate for customer printed guest checks and waiter pads. Pegasus Ventures happily answers all questions sometimes leading to additional quotes as we ensure the custom quote both needs needed specifications while keeping costs down. The standard size guest check cost less than sizes requiring more cuts.